Have you ever heard the expression, "An exhibition a day keeps the devil away?" Ok, I made it up, but in a nutshell, that sums up my religious philosophy. And that's why, for the upcoming Thanksgiving weekend, I want to present you with a whole spread of delicious art exhibitions that should keep the devil away for the entire week. I would start with a pleasant drive to the charming city of Carlsbad, just north of San Diego. There, in celebration of the tenth anniversary of the City Library's Cannon Art Gallery, you will find a rather theatrical presentation of large-scale paintings by DeLoss McGraw, a California artist who these days makes his home in Arkansas. In his signature quirky style, which I would describe as cynically romantic, the artist presents scenes from the life of a child who famously refuses to grow up. The inspiration for these phantasmagorical, bursting-with-color paintings came from the Nobel Prize-winning novel by Günter Grass, The Tin Drum, telling the story of the brutal years of life in Germany during the Third Reich. You might also remember the excellent movie of the same title, which won an Oscar for Best Foreign Film in 1980. 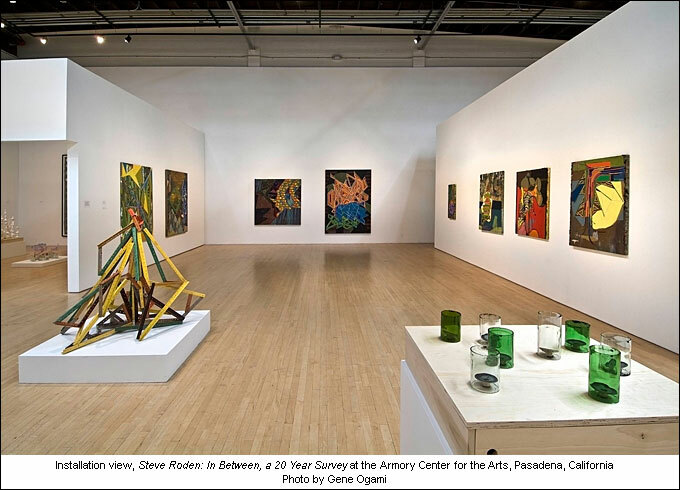 My second suggestion would be a trip to Pasadena, to the Armory Center, to enjoy the exhibition of paintings, sculptures, films, and videos... all done by Steve Roden, a Pasadena-based artist of national and international acclaim. This exhibition had been on my agenda since I read a few weeks ago an enthusiastic review of this show in the LA Times. I did expect to like this exhibition, but I was not prepared to be blown away by the dancing energy of his abstract compositions with their joyful clash of colors. 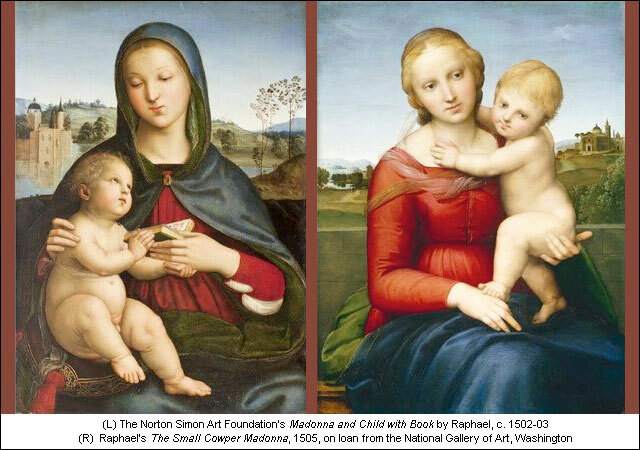 It's only a ten-minute walk from the Armory to the nearby Norton Simon Museum, where you should be prepared to drop to your knees at the extremely rare sight of not one, but two Raphael Madonnas, shown side by side; one belongs to the Norton Simon, the other is on loan from the National Gallery in Washington. It's fascinating to compare them and to see how quickly Raphael's vision of Madonna changed from the rather pious one, created when he was only 20 years old, to the much more earthy, realistic presentation of the same subject, painted a few years later. 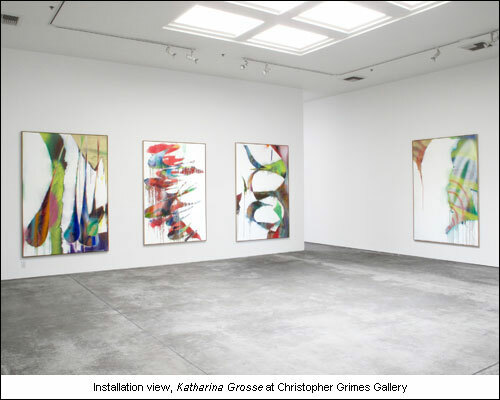 So now, let's go back to our home turf in Santa Monica, to Christopher Grimes Gallery, where you might get a little bit drunk on the colors and beautifully controlled mayhem of the gestural paintings by celebrated German artist Katharina Grosse. I've followed her career since her site-specific installation at the Hammer Museum almost 10 years ago where, in her trademark style, she covered the huge expanse of walls at the museum entrance with a wild spray of paint. 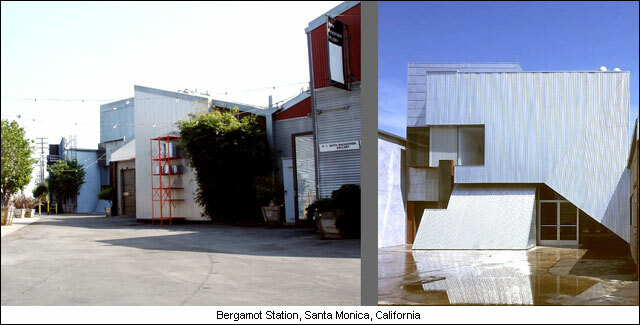 Finally, I want to spread the good news coming from Bergamot Station, where a number of galleries have decided to keep their doors open on Sundays. It always struck me as odd that people couldn't see exhibitions on their day off, and I would assume that the state of the economy eventually persuaded the dealers to have more visitor-friendly hours. I'm definitely planning to stop by Bergamot Station this Sunday, especially now that I've heard the rumors of delicious sausages sold there from gourmet food trucks. Yummy.